Read id stored in the old ecu using the intelligent tester. Read the id written on the tire pressure monitor valve. It is necessary to register the transmitter id in the tire pressure warning ecu when replacing the tire pressure warning valve and transmitter and/or tire pressure warning ecu. Prepare all of the transmitter id data before starting registration. Read the registered transmitter ids that are stored in the ecu using the intelligent tester and make a note of them. 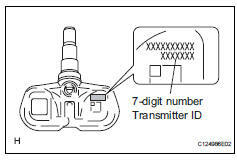 If reading stored transmitter ids is impossible due to malfunctions of components such as the tire pressure warning antenna and receiver, remove the tires from the wheels and check the ids located on the tire pressure warning valves and transmitters (see page tw-60). When replacing the tire pressure warning valves and transmitters, make a note of the ids written on the tire pressure warning valves and transmitters. *1: Read and write down the id (id1 to id5) by using the data list. *2: Select regist tire set following the intelligent tester screen (utility - regist tire set). *3: Select the registration mode "main". Input the id (id1 to id5) using the intelligent tester and transmit it to the tire pressure warning ecu. Set the id transmission condition to "id registration is complete". 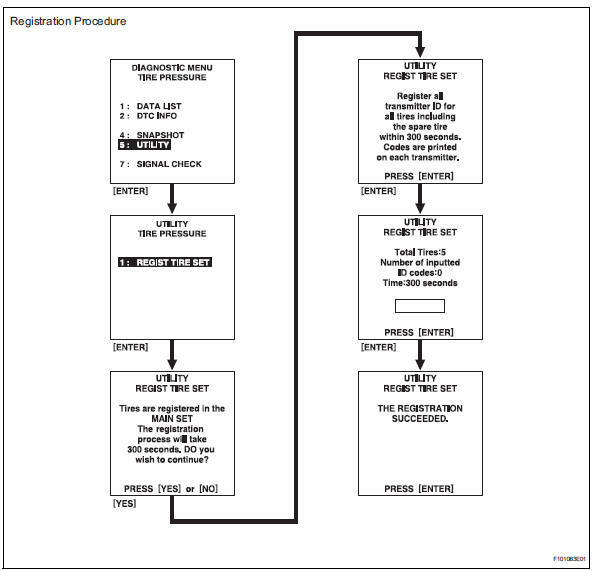 The previously registered ids will be deleted from the memory when the registration is completed. If the operations of *1 to *3 are not completed within 5 minutes, the mode will return to normal operation mode. Set the tire pressure of all wheels (including the spare tire) to the specified value. Connect the intelligent tester (with can vim ) to the dlc3. Select "signal check" mode on the intelligent tester (with can vim ) (see page tw-12). Confirm that the transmitter ids and tire pressure data for all the tires are displayed on the intelligent tester screen. It may take up to 1 minute to update the tire pressure data. If the ids have not been registered, dtc c2171/71 is set in the tire pressure warning ecu after approximately 60 minutes.